The Urban Politico: The Hurt Locker: War is a drug. 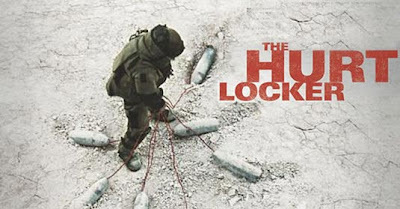 So first off let me just say that I've seen The Hurt Locker and my personal opinion is that it is one of the most thrilling and riveting movies I've seen in a very long time. It is nominated for NINE Academy Awards, tied only with Avatar for the most nominations this year. If she wins this Sunday, the film's director Kathryn Bigelow (who ironically was once married to her chief rival in the best director category James Cameron for Avatar) would be the first woman ever to take home the best director statue for this sleeper hit which had a budget of only $11 million dollars. The movie has gotten praise from critics for it's grit, unbelievable suspense, and realism. Don't get it twisted, this is an action movie which happens to be set in Iraq. It's edge of your seat suspense thriller with basically zero political spin which is a rarity for most of the Iraq war movies. It seemed that this low budget masterpiece was going to go down in history as one of the best films ever made, until articles began popping up in the past few weeks written by primarily by veterans who complained about mistakes and inaccuraccies made in the film. 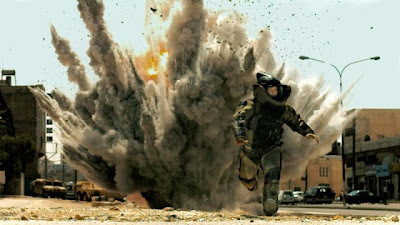 One of the main criticisms is that the movie makes the soldiers, who are a part of the Explosive Ordnance Disposal unit (who's job is to disarm improvised explosive devices), act more like cowboys than actually real life soldiers stationed in Iraq. Obviously, since I am not a veteran I cannot portend to know how accurate the movie is. There are some who argue that all the controversy and criticism is warranted, but others simply think that the film is being attacked because the director is a woman on the verge of making Oscar history. I'm not sure who is right. All I'm saying is that for two hours I'm not sure I exhaled. It's that good. Watch it and judge for yourself.